"Quilting Makes My Heart Sing." Sew Musical 2018 Row x Row Begins June 21st! One week ago today, I found myself sitting in a sunny classroom with Amy Butler. That's right,THE Amy Butler, founder of Midwest Modern, major player in the modern quilt movement, color and design master - - AMY BUTLER. To say I was star stuck is an understatement but if you've ever had the chance to meet her you know she is a gracefully genuine woman who connects with everyone she meets. Our focus was to develop our own personal color scheme and it was unlike any sewing class I have ever taken. In fact we didn't sew at all. Amy began the class with a short deep breathing exercise and then went on to explain how we would be "working from our heart space." We spent time sorting through photos, magazine tears and ephemera that appealed to us making a "pile of beautiful images" and then refined them to discover the hues that really spoke to our hearts on that particular morning. We then created a personal poster of these images "like a spirit dump onto the page" as Amy put it. I must have been longing for the Utah desert that morning because I came away with a beautiful color scheme that spoke of red rocks, sagebrush and sun washed linens. It was a freeing, uplifting experience I plan to use often in my designs. I can honestly say that it made my quilting heart sing! I think that's the feeling Marianne Michaels had in mind when she created our 2018 Row by Row Experience pattern, sample and kit! 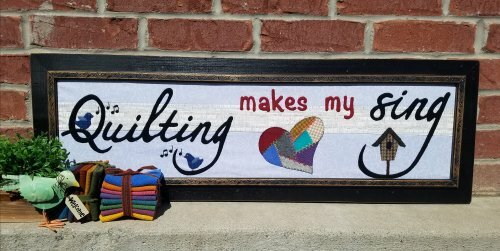 "Quilting Makes My Heart Sing" is the free row pattern you can receive at our shop June 21st-September 4th, 2018. Simply ask at our register! Kits will be available for purchase as well as our collectable fabric license plates. This year's theme is "Sew Musical." Collect free row patterns as you visit participating shops across the US, Canada and Europe! 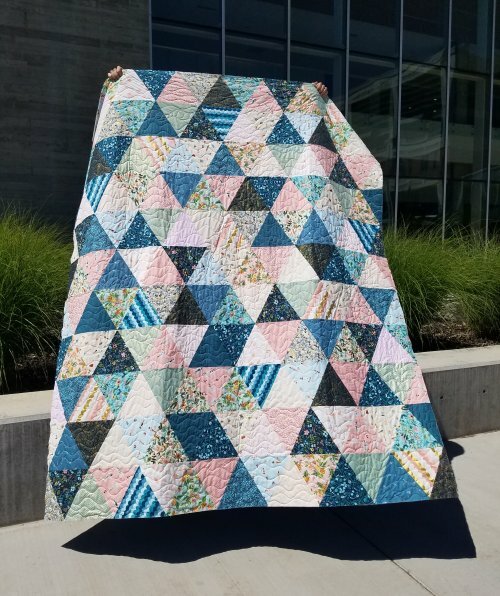 Be the first person to bring a finished (quilted, bound, labeled) quilt using at least 8 different rows from 8 different participating stores into a participating quilt shop and receive a bundle of 25 beautiful fat quarters! We look forward to meeting "rowers" from near and far as you visit our shop. We hope to make your quilting heart sing! Have you checked out the new calendar feature on our website? Learn about promotions such as our Marvelous Monday and Stuff-a-Bag Sales. Know when we are closed for holidays. Check dates & times for classes and events. Simply visit our website (click the link below) and select the "Calendar" option from the headings across the top of our page. Stay in-the-know and join in the fun year-round here at the Corn Wagon! My quilting heart sang when I saw the Amalfi fabric collection by Rifle Paper Co. I threw in a few Dear Stella fabrics to mix beach sunbathers with ocean mermaids in what I'm calling my "Where Surf Meets Sand" quilt. I love this simple yet effective Equilateral triangle pattern from Art Gallery Fabrics for showcasing prints that I otherwise struggle to cut into. It's a free pattern pdf on their website! We have a limited number of kits for this twin size quilt. The fabric is going fast! June 18th - 25% off in-stock, regular price BOOKS & PATTERNS! Select books and patterns in our bargain basement (look for the red dot) are 50% off! June 20th at 5:00 p.m. here at the shop! Marianne Michaels has lots of tips & tricks that she is excited to share with you. Sit in on this one hour, free demo to learn all the basics of wool applique and ask questions with our wool expert. June 21st at 10 a.m. - 11:30 a.m.
Come learn the art of wool dyeing! We will cover the basics: wool selection, what dyes to use, how to get the colors you like. The class will be held at Marianne Michaels' home dyeing studio. $15 class fee. No supplies will be needed. See our website under classes for all the details. Sign up online or in-store today!